The Gathering, Gardening, and Agriculture curriculum is available as a downloadable pdf or a printed book. To request a hard copy, contact Nancy Smith at nms011@uark.edu or (479) 575-3556. The activities and course materials are available as pdfs and PowerPoints to make duplication and class preparation easier. This curriculum is designed to be taught in sequence and as a whole to ensure student mastery of the lesson objectives. Each lesson is organized in two main parts. It includes information for the teacher to prepare and teach the lesson framed around the 5E’s. It also includes the subjects covered, standards filled, approximate duration of the lesson, and appropriate class size. The pages for the educator are designated “Teaching Archeology” at the bottom of the page. The curriculum also includes activities and reading material for students. These are designated with “Student Archeologist” at the bottom of the page. There is a finding aid to help identify the materials for each lesson. Overview: Summarizes the key ideas in the lesson and makes connections between lessons. Lesson Objective: The key ideas that students will acquire and a summary of the activities students will complete to learn the concepts and grasp the enduring understandings. Critical Thinking Question(s): The essential questions that guide the lesson. Materials: Items needed to complete the lesson, divided into items needed for each student, for the class as a whole, and for teacher-led instruction. The materials are provided in the curriculum book and are available for download. Other materials are inexpensive and easy to find and prepare. Background: Information on the direction of the lesson, how to plan for it, and content to be shared with students. Getting Ready to Teach: Step-by-step procedures to prepare to teach the lesson and coordinate all activities. In some cases, materials need to be prepared or students assignments made a few days in advance of teaching the lesson. Key Terms: Vocabulary words for reference and use in writing assignments. Engagement: An activity to discover what students know about the concepts to be taught. Exploration: An activity or activities designed to teach new concepts and understandings. Explanation: Reflection on the content and concepts taught to reinforce the new knowledge; review of Background information. Elaboration: An activity or activities designed to challenge and extend students’ conceptual understanding and skills. Evaluation: A method for students to demonstrate their grasp of the concepts and objectives. and introduces students to the critical thinking and analysis processes that archeologists use to study the past. Students explore chronology, observe objects and infer their use in an archeological context, and use evidence to answer questions about the past. It introduces students to the importance of chronology and context in the study of archeology. Lesson Three: First Gardens. This lesson introduces students to the basics of stratigraphy and students learn how archeologists determine the relative age of artifacts. Here students look at domesticated plant seeds and learn how Native American cultures changed with the development of gardening. Lesson Four: Changing Gardens and Evolving Fields. Lesson Four introduces students to changes associated with the adoption of corn agriculture, introduced from Middle America during late prehistoric times, using both archeological and Native American perspectives. 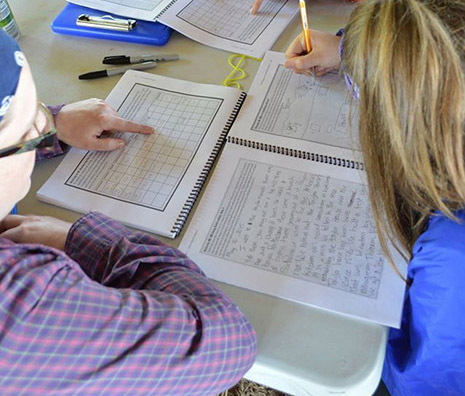 Assessment is an integral part of each instructional event and the lesson as a whole. Assessments are designed to determine if students have grasped the enduring understandings, and all learning activities are designed to enable students to complete the assessment successfully. In most cases, assessments are simulations of problems, issues, or challenges that a professional archeologist might face. They are usually performance based, allowing students to relate what they are learning to real-life contexts and situations. Assessment in the unit is primarily formative, to check and refine understanding as learning progresses. All activity sheets can be picked up and graded to assess reading comprehension, question development, use of sources and evidence, and communication. There are also a number of Optional Writing Prompts at the end of lessons that could be assigned as assessments. Students should be encouraged to use the Key Terms to respond to the questions. In this curriculum, we reference a few teaching tools that may not be common practice. One is the “Curation Shelf.” It is a way to encourage students to ask questions, but avoid distraction from the current topic of study or delay for discussion in a future lesson. The Curation Shelf is a place to record questions to let students know the questions are important. It is also a visual reminder for the teacher to revisit it. Set aside a piece of chart paper or a place on the board and label it “The Curation Shelf ” and use it to record questions while teaching this curriculum. Lessons Two through Five include “Arkansas Case Study” reading assignments for students. They should be assigned as homework, or students should be given time to read them before the lesson is taught. These short essays provide students with background information for the upcoming lessons. They may include unfamiliar terms and students may have questions. We suggest prior to teaching the lesson that teachers ask students what questions they have and record those questions on the Curation Shelf. Tell students they will learn the answers to these questions by doing the activities and participating in class discussion. The terms will be defined in the Key Words log. Lessons Two through Five include period-appropriate recipes that students can take home and make with their parents, or experiment with at school. These recipes help students see that the plants discussed in each lesson are real foods that people ate in the past and in some cases continue to eat today. Lesson Three focuses on Arkansas’s first gardeners and the domestication of local wild plants. It is helpful to show students examples of the seeds and plants. Packets of the sunflower, goosefoot, maypop, and sumpweed seeds highlighted in the lesson are available upon request from the Arkansas Archeological Survey. The availability may be variable by season. Contact Dr. Emily Beahm for seed packets. The activities and course materials are available as pdfs and PowerPoints to make duplication and class preparation easier. Check out Lesson One – Archeology Is about People.